Ian's story of being banned from Amazon for returning too many things reminds me of a Seinfeld episode, where Kramer gets banned from Joe's Fruit Market -- the best fruit market in town -- when he tries to return a sub par peach. JERRY: Did you get that at Joe's? KRAMER: Yeah, of course I got it at Joe's. JERRY: That's surprising, his fruit is usually the best. KRAMER: You know what I'm gonna do? I'm gonna return this. JERRY: You're returning used fruit? KRAMER: Jerry, this peach is sub par. JOE: Hey, you got a bad peach? That's an act of God. He makes the peaches. I don't make the peaches, I sell the peaches. You have a problem? You talk to him. KRAMER: You know this whole place is going vrrrrrrrrrrrrt, downhill. I could have come in here last week with a bad plum but I let it go. JOE: Well let me put a solution for you: do your business elsewhere, I don't want your business. KRAMER: Oh now you don't want my business. JOE: No, I don't want your business and from this moment you're banned from the store, you're banned! KRAMER: But what am I gonna do for fruit? In the normal course of business, the occasional problem is inevitable. The rate at which such problems have occurred on your account is extraordinary, however, and cannot continue. Effective immediately, your Amazon.com account is closed and you are no longer able to shop in our store. And this is not the first time Amazon has banned users. Without an Amazon account, users like Ian can't access their Kindle books online. The DRM infecting their local copies of those ebooks prevents them from moving the books to another device they might actually be able to use without being forced to depend on an arbitrary and temperamental owner. Since they don't get warning before being banned, they may not even have all of the books they have purchased in the past downloaded to their local device, and being banned means they can't access anything stored under their Amazon account. Changes to Service. Amazon reserves the right to modify, suspend, or discontinue the Service at any time, and Amazon will not be liable to you should it exercise such right. Termination. Your rights under this Agreement will automatically terminate without notice from Amazon if you fail to comply with any term of this Agreement. In case of such termination, you must cease all use of the Software and Amazon may immediately revoke your access to the Service or to Digital Content without notice to you and without refund of any fees. Amazon's failure to insist upon or enforce your strict compliance with this Agreement will not constitute a waiver of any of its rights. Amazon CEO Jeff Bezos has said in the past, "Our vision is every book, ever printed, in any language, all available in less than 60 seconds" -- but like a fortune cookie, to understand what he really means here you need to add "exclusively controlled by us" to the end of the quote. After extensive argument, Amazon did decide to give Ian one more chance, and restored his account, but this is nonetheless a warning of the way DRM can be used to control users. Whether it's right for them to be banning people for returning too many things or not, it isn't right for them to have this much control over what and how people can and can't read. DRM is rotten and needs to go. 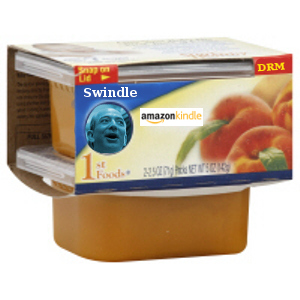 So, taking inspiration from Kramer and Joe, this morning we decided to send Amazon CEO Jeff Bezos some peaches, from Defective By Design. Turns out fresh peaches of the kind Joe would be proud of aren't in season until May, so we looked for the next best thing appropriate for someone whose company throws frequent temper tantrums to try and control what other people do -- peach baby food. We hope he gets the message that he's swindling his customers and in the process undermining important fundamental freedoms to read and share. Amazon seems to understand this message when it comes to music -- why don't they get it when it comes to the Kindle? 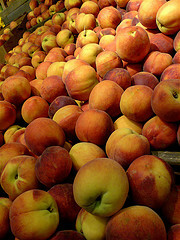 You can help us "impeach" Bezos by sending him some more peaches. Don't forget to include a gift note with it linking back to DefectiveByDesign.org, and be sure to let us know too, at info@defectivebydesign.org. Of course, if you have a Kindle, you might want to return that too. Peaches picture used under the CC BY-SA 2.0 license.